Tributes have been paid after the sudden death of respected radio commentator David Oates, aged 50. Best known for football and rugby league commentaries, he was a lifelong Blackpool FC supporter and a keen runner. The broadcaster had recently left BBC Sport and was working as a freelance radio journalist. Oates joined the BBC in 1986 as sports editor at BBC Radio Manchester and doubled up as the station's Manchester United reporter. After eight years in the post he joined BBC Radio Sport in London as a producer before taking on a position combining presenting, commentating and reporting roles. Richard Burgess, head of radio sport, said: "Everyone at BBC Radio Sport is in shock at this terrible news. David was a trusted and much-loved colleague who provided many years of loyal service to the BBC. "His enthusiasm for commentating and reporting on football and rugby league was boundless - we will all remember with great affection his love of Blackpool FC in particular. To lose him at such a relatively young age is a tragedy. "Our thoughts are with his wife Charlotte and daughters Imogen and Kate at this desperately sad time." Oates was commentating for BBC Radio 5 live when Fabrice Muamba collapsed on the pitch at White Hart Lane in March 2012 having suffered a cardiac arrest while playing for Bolton against Tottenham. Jonathan Wall, acting controller of BBC Radio 5 live, said: "No-one ever had a bad word to say about David. "I will remember the quality of his commentary as the Muamba story unfolded, his great skill as rugby league commentator, but most of all his love of Blackpool FC and the Blackpool songs he used to sing in the office." 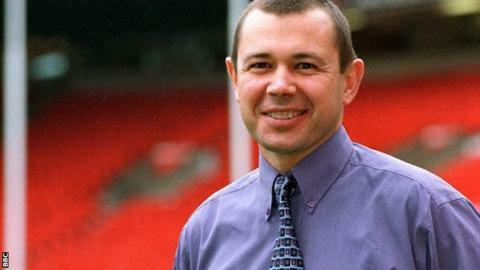 Oates covered three football World Cups, three Rugby League World Cups and two Commonwealth Games. In 2012, he reported on his first Olympic Games and commentated on the shooting events in London including Peter Wilson's gold medal for Britain in the double trap discipline. Fellow TV and radio broadcaster Nicky Campbell tweeted: "RIP David Oates. Wonderful pro. Lovely human being." "As a broadcaster he was the consummate professional: his commentaries were never anything other than accurate, intuitive and knowledgeable," said RFL chief executive Nigel Wood. "As a man, 'Oatsie' was funny, immensely likeable and thoroughly decent. We are all going to miss him terribly." Super League side Leeds Rhinos added their tribute on Twitter: "We would like to offer our sincere condolences to the family of David Oates, who commentated on many Rhinos games for BBC 5 Live, RIP"
Blackpool Football Club tweeted on their official account: "Blackpool FC would like to pass on its condolences to the family of @bbc5live broadcaster David Oates. Big Pool fan, will be sorely missed." Daily Telegraph's chief sports writer Henry Winter tweeted: "Such sad news about BBC commentator David Oates passing away. Good broadcaster & always great company. Thoughts with Charlotte and daughters." And broadcaster and former football star Stan Collymore tweeted: "Sincere condolences to Lotty & Family at hearing the sad news of the death of David Oates. Worked with him many times, devastating news." Listen to BBC Radio 5 live's tribute to David Oates.